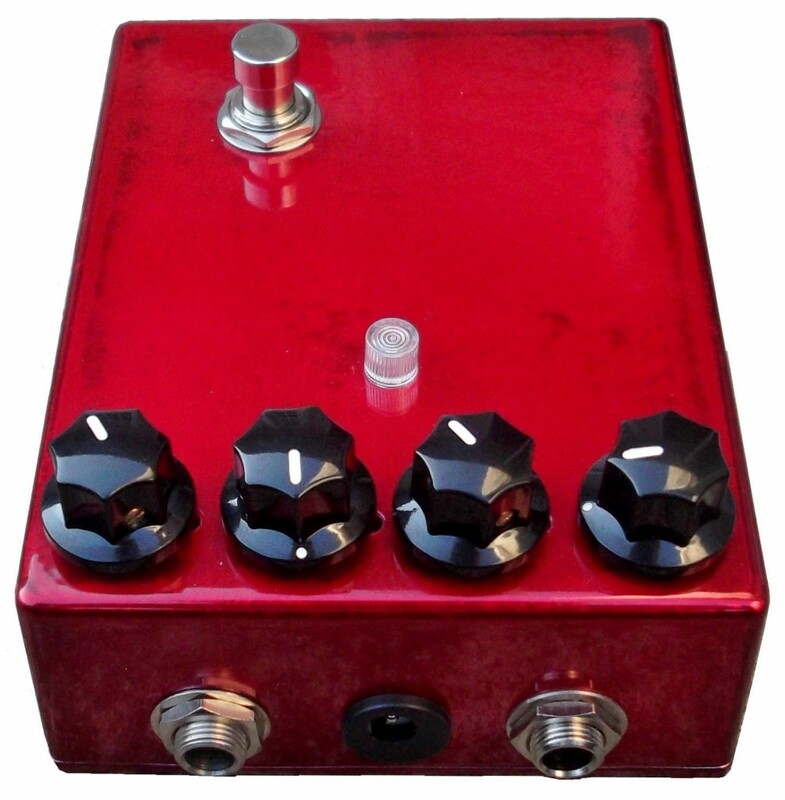 This item is currently unavailable and is replaced by our pedal board friendly Red Stardust Germanium Fuzz Face. Also, please CHECKOUT THE CHASE TONE™ ’68 Red Velvet FUZZ™! Individually custom built and perfectly tuned with more fuzz and harmonic complexity allowing notes to sustain and easily develop into feedback. A pure vintage organic fuzz tone. Check out the sound clips! Output Control: Maximizing this control increases sustain, punch and treble bite. The sweet spot is adjusting it in comparison to your tube amplifier volume and EQ settings- An optimal setting is usually between 3/4s and maximum when turning in a clockwise direction. Fuzz Control: Maximizing this control increases total amount of fuzz. Customized circuit offers improved range of control allowing less fuzz and more over-driven fluid tone for the majority of this control’s travel. Temper Control: Optimal adjustment is around half-way(noon) at 72 degrees Fahrenheit. Fine tune adjustment in either direction may be necessary to compensate for temperature fluctuations. A gated effect can be achieved when adjusting this control at its extreme settings. If the quality of the fuzz tone is not optimal, this is the knob that usually needs adjustment. Fine tune adjustment by ear is recommended. Headroom: Maximizing this control in the clockwise direction removes it from the circuit. Adjusting in a counter-clockwise direction adjusts the headroom clipping of the input circuit, reduces bass frequencies allowing better compatibility with dark or humbucker equipped guitars, and helps eliminate oscillations when placed after a wah pedal. Battery Drawer: Simply press inward and upward to disengage lock. No tools required! * If using a power supply it must be a 9V Positive Ground supply. A standard negative ground power supply will not work! Protection circuitry prevents damage to the circuit briefly, if the wrong power supply remains plugged in to the device, damage may occur. !! Only use a 9V positive ground power supply !! * Designed with pedal boards in mind. * High quality-low power consumption RED LED. Strong durable surround scatters and fragments the LED light to give 360 degree viewing angle. * True-Bypass via a significantly higher quality 3PDT stomp switch than the boutique market standard. * High quality Switchcraft jacks. * Please note: The NOS brown paxolin circuit board option is sold out. These now ship with a different circuit board material. 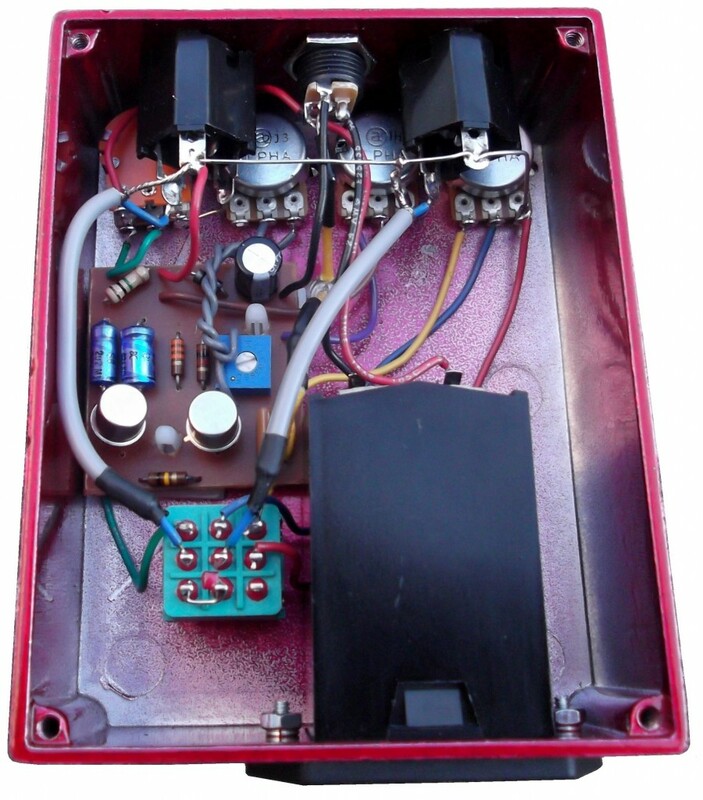 * Low Noise High Quality Shielded Wiring – More accurate and focused fuzz tone. * New Old Stock 1960s Allen Bradley Carbon Resistors. Warm and smooth over-driven tone compared to modern carbon film resistors. Same resistors used on the Apollo Missions. * NOS PNP Gold Lead Germanium transistors. The vintage germanium transistors used are individually hand selected and audited in the circuit for optimal tone, low noise and reliability. * Vintage 1960s Mullard capacitor for that unmistakable thick smooth and complex tone not heard in modern polyester capacitors. *Built with pride and care, and individually fine-tuned and tested one at a time in the USA. $9.50 USPS Priority Mail in USA w/ Insurance & Deliver Confirmation. $28.00 International USPS Priority Mail & Insurance to Canada. * 4-6 weeks wait time from date of payment. 1968 Fender Stratocaster Replica w/reverse staggered pickups, reverse angled bridge pickup, and reverse neck. Tone control modification to bridge single coil pickup. Clean amp tone & then Fuzz pedal engaged at 12 seconds. Korg Digital Recorder- Reverb added for ambience. while never being too bright. 1997 Fender Jimi Hendrix Tribute Stratocaster. Custom fine tuned Chase Tone Germanium Fuzz Face Replica. Electro-harmonix Holy Grail Reverb added for ambience. Credits: Customer sound clip at band rehearsal.